A rain barrel is a container used to collect rainwater; the use of these can have a positive impact on your community’s combined sewers and your households. After talking with the City of Evansville’s Stormwater Coordinator, Karan Barnhill, we toured Pinterest to provide helpful rain barrel tips and tricks. For the past two years, Evansville has partnered with Coca Cola which donates 55-gallon drums to the City for their Rain Barrel Decorating Contest and Auction. The City encourages organizations to decorate the barrels; they are then displayed at the Evansville Zoo. On Earth Day, the City hosts a silent auction where community members bid on the decorated rain barrels. • Reusing the rainwater for watering household plants, gardens, lawns, dogs, chickens, etc. Evansville is under a Consent Decree from IDEM for their combined sewers. 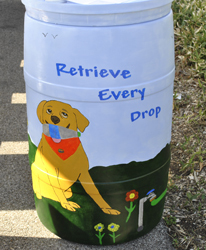 Since initiating this program, Evansville has decorated more than 150 rain barrels, which is equivalent to nearly 100,000 gallons of reusable water. Karan is getting ready to incorporate a third rain barrel to use at her home to eliminate the localized flooding that is causing rainwater to seep into her basement. “It’s only a 55-gallon drum, but if everyone had one, [rain barrels] can make a huge impact,” Karan said. Start a rain barrel initiative in your community; visit this pin to learn the benefits, costs, and maintainence of collecting rain water. Brighten your garden with painted flowers and a pop of color! When you're searching for that perfect color, make sure the paint is appropriate for the barrel's surface. Interested in making your own rain barrel? This pin provides step-by-step instructions to guide you from start to finish. Start educating kids early about the benefits of collecting rainwater. Programs like the City of Evansville's allow kids to decorate their own barrels while also teaching the importance of reusing rainwater. Are you an outdoor enthusiast? Whether you enjoy fishing, hunting, or just relaxing at the lake, personalize the barrel to reflect your interests. If making your own rain barrel doesn't appeal to you, they can be purchased at places like Williams and Sonoma, Lowe's, or Home Depot. Spend a little to save you tons on watering your lawn; purchase a standard 55-gallon trash can to create your own affordable rain barrel. Do you have artistic talent? Turn your rain barrel into a work of art that will not only be functional, but also a decoration you'll want to showcase. To improve pressure and ensure your watering can will fit under the spout, create a platform to host your rain barrel. Incorporate a barrel-painting contest into your next kids' community day. Make the most impact possible; create a rain barrel today. It is not too late to reap the benefits yet this watering season. Send your rain barrel ideas our way!